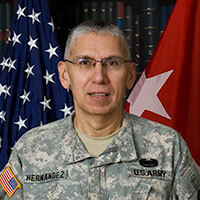 Lieutenant General Hernandez retired on 1 November 2013 following 39 years of distinguished service in the United States Army. His last active duty assignment was as the first Commander of Army Cyber Command (ARCYBER), where he was responsible for the daily operations and defense of all Army networks, and when directed, conduct the full range of cyberspace operations. In addition to building a cyber force of more than 17,000 people, he led the development of a wide range of transformational concepts, plans and programs to increase the Army’s ability to conduct Land and Cyber operations. As the Army’s lead for all cyberspace activity, he was the force modernization proponent for cyber doctrine, training, leader development, organization, materiel and people. He developed strategic direction, requirements and an acquisition approach for all cyberspace operations in the Army. Army requirements. As the Chief, Military Training Mission, Saudi Arabia, he was the senior defense official to the U.S. Ambassador. He led the largest security assistance program in the world, oversaw the Foreign Military Sales program, strengthened the strategic military partnership and increased readiness and interoperability. As the Commanding General of Human Resources Command, General Hernandez directed the personnel management, from accession to retirement, for all soldiers and officers. He transformed personnel services and the management systems to support an Army at war. General Hernandez has extensive operational experience, and has held commands at each level from Lieutenant to Lieutenant General. He served as the Assistant Division Commander, Support for 1st Armored Division and oversaw the division’s deployment and logistic operations in Baghdad, Iraq. As the Operations Chief in J-39, IO, he established and directed the IO Task Force responsible for supporting the integration of Combatant Command IO plans with USG activities. General Hernandez holds a Bachelor of Science degree from the United States Military Academy, West Point, a Master of Science degree in Systems Engineering from the University of Virginia and a Masters of National Security Strategy from the National War College where he was named a distinguished graduate. His overseas experience includes tours in Germany, Iraq and Saudi Arabia. Currently, General Hernandez serves as the West Point Cyber Chair to the Army Cyber Institute, is the President of CyberLens, LLC and serves as a cyber expert on advisory boards. He has considerable insight and expertise on Cybersecurity issues and was an integral part in MacB strengthen and its considerable offensive and defensive Cybersecurity capabilities to meet current and future needs of ARCYBER, as well as the broader Cyber community. Lieutenant General Hernandez has been a Member of Board of Advisors at Macaulay-Brown, Inc. since May 19, 2014. He has been a Member of Public Sector Advisory Council at Palo Alto Networks, Inc. since February 12, 2015. He and his loving wife, Pat, grew up together in Palmerton, PA and were married in 1976 upon graduation from West Point. They currently reside in the DC area and have two wonderful children.